Stroke, brain and spinal injuries, Parkinson’s, Alzheimer’s, MS, Epilepsy and Amyotrophic Lateral Sclerosis (ALS) all take a heavy toll on those affected, diminishing life expectancy and life quality. An innovative new research and treatment facility holds a promise of opening up the countless lives touched by these and other neurological disorders. HealthPartners Neuroscience Center, a new, four-story, 174,000 s.f. facility was recently recognized by NAIOP MN with its 2017 Award of Excellence in the category of Medical Office. 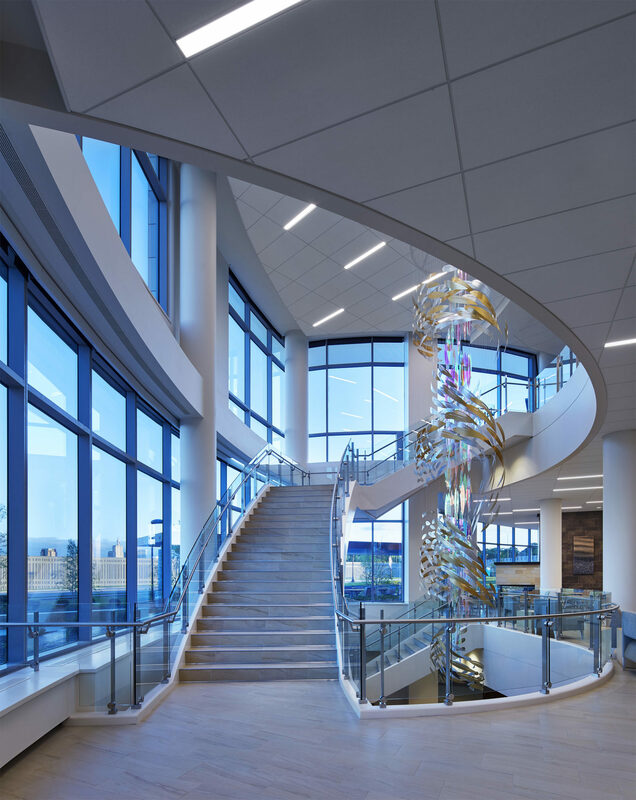 The building is the largest free-standing neuroscience facility in the Upper Midwest, and one of the first in the nation. The destination medical center houses clinical treatment, rehabilitation and research within one facility that is designed to be unique, welcoming and efficient. Designed by BWBR, the facility features abundant natural light drawn from its undulating glass curtainwall exterior. 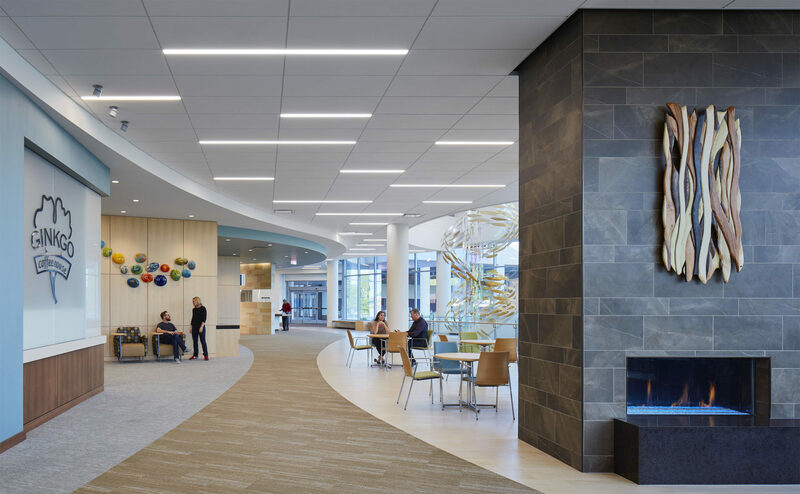 Building features include simplified circulation and wayfinding, large consultative exam rooms, and technology to aid in patient education. Both the building and its connected 600-car parking ramp feature simplified design flow to aid in wayfinding. The design of the facility also encourages collaboration among clinical and research departments, and the ability for future growth. Clinical trials, rehabilitation, patient diagnosis and lab work all happen here; creating an outpatient clinical rehab/research environment dedicated to the full spectrum of neurological conditions. The Neuroscience Center will accommodate 200 staff and is expected to see over 50,000 patients per year. HealthPartners’ investment in this facility comes at a time of dramatically increasing need for treatment of neurological disorders. Stroke and Alzheimer’s are among the leading causes of death in the U.S. The number of people with dementia is expected to double in the next 20 years, and pain is one of the most common reasons people visit the doctor, according to HealthPartners’ website. KA worked closely with the client, architect BWBR and the project team to work through site constraint challenges including a tight footprint, unique geometry, location adjacent to a major freeway and rail line, and provisions for clear entry, drop-off and wayfinding. Construction commenced in August 2015 and the client took occupancy in January 2017. The NAIOP Minnesota Awards of Excellence program recognizes exceptional developments by NAIOP members, with winners selected by a panel of independent judges. Judges tour the nominated projects and rate them on criteria including site development, architectural integrity, interior design, integration into the community, market feasibility, unique challenges and LEED certification. Congratulations!! Well deserved award for that beautiful building!